ROME - The legend of Leonardo da Vinci is shrouded in mystery: How did he die? Are the remains buried in a French chateau really those of the Renaissance master? Was the “Mona Lisa’’ a self-portrait in disguise? A group of Italian scientists believes the key to solving those puzzles lies with the possible remains - and they say they are seeking permission from French authorities to dig up the bones to conduct carbon and DNA testing. If the skull is intact, the scientists can go to the heart of a question that has fascinated scholars and the public for centuries: the identity of the “Mona Lisa.’’ Recreating a virtual and then physical reconstruction of Leonardo’s face, they can compare it with the smiling face in the painting, researchers involved in the project said. The leader of the group, Silvano Vinceti, said he plans to press his case with the French officials in charge of the purported burial site at Amboise Castle early this week. But the Italian enthusiasm may be premature. In France, exhumation requires a long legal procedure, and precedent suggests it’s likely to take even longer when it involves a person of great note such as Leonardo. Jean-Louis Sureau, director of the medieval-era castle in France’s Loire Valley, said that once a formal request is made, a commission of scholars would be set up. Any such request would then be discussed with the French Ministry of Culture, Sureau said. Leonardo moved to France at the invitation of King Francis I, who named him “first painter to the king.’’ He spent the last three years of his life there, and died in Cloux, near the monarch’s summer retreat of Amboise, in 1519 at age 67. The artist’s original burial place, the palace church of Saint Florentine, was destroyed during the French Revolution and remains that are believed to be his were eventually reburied in the Saint-Hubert Chapel near the castle. 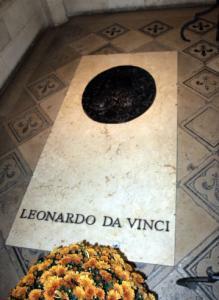 The tombstone says simply, “Leonardo da Vinci.’’ A notice at the site informs visitors they are the presumed remains of the artist, as do guidebooks. “The Amboise tomb is a symbolic tomb; it’s a big question mark,’’ said Alessandro Vezzosi, the director of a museum dedicated to Leonardo in his Tuscan hometown of Vinci. Vezzosi, who is not involved in the project, said that investigating the tomb could help identify the artist’s bones with certainty and solve other questions, such as the cause of his death. He said he asked to open the tomb in 2004 to study the remains, but the Amboise Castle turned him down.